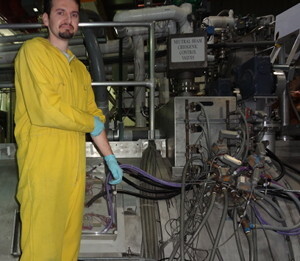 Suiting up to work inside the DIII-D tokamak. I am presently a research scientist working on magnetic confinement fusion energy at the DIII-D National Fusion Facility. My focus is energetic particle phenomena in tokamaks. Nuclear fusion is a process in which atomic nuclei are smashed together such that they join to form larger nuclei. I work in the field of magnetic confinement fusion (MCF) research, where our goal is to develop nuclear fusion as an energy source. There are many resources for learning more about nuclear fusion, including general information such as found on the Wikipedia page. Most nuclear fusion research in the United States is supported by the Department of Energy’s Fusion Energy Sciences division, while some privately funded research also exists. My fusion research is conducted on tokamaks, which are toroidal (donut) shaped devices in which magnetic fields confine hydrogen nuclei at fusion-producing temperatures. These nuclei are produced by injecting deuterium (a nucleus with a proton and one neutron, which is an isotope of hydrogen) gas into the tokamak vacuum chamber and then heating it until the electrons separate from the nuclei. This combination of nuclei and electrons is known as a plasma, which is a state of matter (solid → liquid → gas → plasma, where each “→” represents heating).